This blog post was written by first year English student, Polly Moss. Having reread the first Harry Potter book over Easter for my course, I was struck both by how nostalgic the book made me, as well as how far it was possible to continue to appreciate the series as both a child and as an adult. 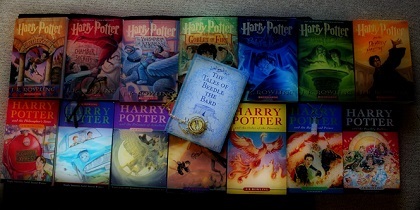 As a child, the magic and world of wizardry is wondrous, and Harry’s adventures are exciting to partake in as a reader. As an adult, these things are still true however the book’s darker themes of death, sacrifice and unconditional love can be appreciated on a new level. This led me to think of other books written for children that I would love to return to as an adult. ‘The Chronicles of Narnia’ are another popular children’s series that can be returned to as an adult and still enjoyed and appreciated despite their intended demographic. Not only can Lewis’ worldbuilding be appreciated on another level once we have grown up, but the series’ themes and lessons, as with the Harry Potter series, are ones that can be reflected upon more deeply once we are older. Though there has been much academic discussion surrounding the Christian influence on the books, powerful moments such as Aslan’s self-sacrifice can be appreciated regardless of age or religion. The Little White Horse by Elizabeth Goudge is a novel which has been a personal favourite of mine since I was very young. Unlike the other books I have discussed there is less fantasy to this novel and a less clear fight between good and evil. The story of the orphan Maria, who tries to fix her family’s centuries old feud with another local family having moved to live with her uncle perfectly balances realism with a slight touch of magic in a way that could capture both a child’s or adult’s imagination. Overall it is a beautiful story that is the perfect type to curl up with and enjoy with a cup of tea and a blanket. We should not disregard literature simply because its intended demographic is children. I would encourage everyone to return to some of their childhood favourites for both the feeling of nostalgia as well as to see just what lessons we can learn from old favourites with our new experience.